Hey guys, it’s Marcus here from simplesitesbigprofits.com! 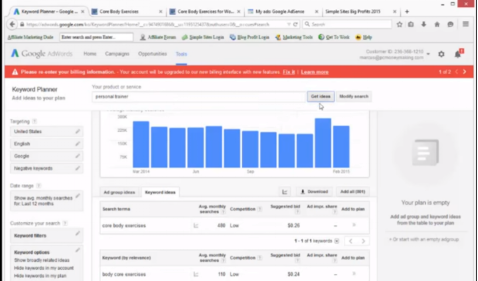 Today we are going to talk about how to make money with Adsense in 2015. And what this comes from is an email that I received earlier today from someone asking, “Marcus what are the plugins and things you use to make money with Adsense on your site? Is it just putting Adsense up there? Is that all? Actually, there is more to making a lot of money with this Adsense! I’m going to show you how controlling your blog and controlling the flow of your visitors has everything to do with how much of money you make online! 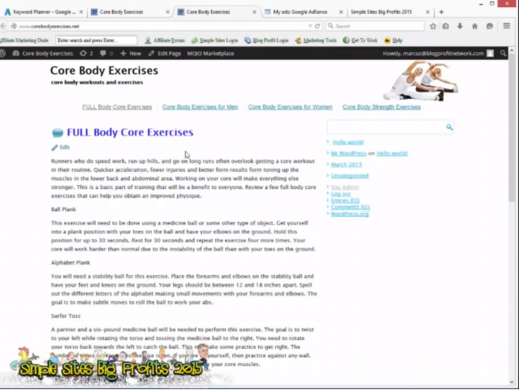 We’re gonna jump over to our test blog corebodyexercises.com. We’re going to take a look at this and see exactly what’s going on, where we add our Content, where we put our Adsense and everything like that. If you have a blog like this and assuming you have some content and something for your visitors to see, what most people do is they just go into Google Adsense and they generate a code, put it in the sidebar over here and put it a couple places in the content. While this is good, what’s gonna happen is the traffic’s gonna come in and Adsense is going to pull ads based on “Core Body Exercises” which as you could see from the keyword planner is a very low competition word so it’s not gonna make me a lot of money. I’m just gonna get a portion of whatever these guys are paying which is not a lot. What I want to do is I want to flip this market and make a lot of money! You’ll notice that this niche was found using our trigger word list in our simple sites big profit software. You can use this to find your niche to get traffic and you can also use it to flip the market into something expensive. So what we want to do is we want to maybe flip it into a personal trainer, or something expensive. If we put personal trainer in here, it’s going to trigger a much more expensive ad that’s going to get us a portion of nine dollars versus a portion of 50 cents or 20 cents that was on the other one. So how to choose a personal trainer or something like that would be something we can use. We want to keep this in mind and rather than just adding Adsense on here for the sake of having ads and making a couple quarters a day, WE WANT TO GET THIS TO MAKE LOTS OF MONEY! There’s several different plugins that I use on my WordPress blogs so let’s go ahead and install those now! All of these plugins come with your simple sites big profits desktop software. So in your brand-new software, once you get simple sites big profits software from simplesitesbigprofits.com you could simply open the vault or you could use your money-making tools. When you open the vault you’re gonna notice that we have tons and tons of plugins worth thousands of dollars for you! So after this video you’re gonna want to hop over to simplesitesbigprofits.com and get them! For right now I’d like to show you what they’re gonna do, how to increase your Adsense earnings and why they work so well! First and foremost we’re gonna go to the plugins section and we’re gonna go to add new. We’re gonna go ahead and hit upload plug-in because these are the plugins that we downloaded from our simple sites big profits desktop software. We’re gonna go ahead and hit browse. Then we’re going to go ahead and do Widget control which is our main plug-in here right like this. What widget control is going to allow us to do is separate the pages and posts that we want to show Adsense in our sidebar. So if you’re doing an opt-in, sometimes Google Adsense doesn’t allow it so we want to allow it to control it. Here we have installed widget control. We just click on widget control and now we can go to the adsense tab and say well where do we want this? Do we want it in all the pages? Do we want it in all the posts? Do we want it in just post or page 53? You could type this in here and control it that way so it’s very very very important to be able to use and structure your content and make it only show up where you want it. That’s the first plug-in we’re going to use. The next one is going to be our easy blog ads plug-in. This is going to allow us to put little ads on our site. Here you can see the smart affiliate ads program. It’s going to allow us to link outside of our site. Track what people are clicking on so we see what they’re interested in. Put them to those expensive Adsense clicks. If you had a little ad that said how to choose a personal trainer, you send them out to your personal trainer site. Now you’re getting a lot of money for your traffic in a really really simple and easy way and you’re learning about your market! Lastly we’re going to do the content cache finder which is also a very good plug-in that attracts the eye. The goal here is to get our content on the site consumed while kind of letting people’s ADD be at work and leading them to things that they would want. We don’t want them to just read a route about the ball plank and then say well thank you and leave or click a cheap Adsense click. We want to lead them to things that not only help them but also make us lots of money! All come with simplesitesbigprofits.com all you got to do is go here and get your copy. You get all the updates, you get everything and you’re ready to go! Very very easy and very very simple to install! Now that I’m armed with these plugins, what I want to do is I want to put them to work and actually have them control my blog. The way that I do that is by going to widgets and I’m gonna get rid of all this stuff that’s over here in the widgets section here like the search box and all the default WordPress stuff. Then we’re gonna drag these over here so that they disappear. You’ll notice once they’re gone, your content will get a lot bigger and your widgets will disappear. Next we’re going to go back to the widgets section and you can see how I toggle back and forth. It makes it a lot easier. Work on your blog when you’re using Chrome or Firefox or one of the browsers that supports tabs. I’m going to go ahead and drag widget control up here. And I’m going to put our monetize text widgets up here. This might be called easy blog ads depending on the version you’re running. We have basically controlled our blog. We’ve hijacked our blog and we’re controlling our widgets with these two plugins. You can see I can go into monetized text hit manage. Now all I have to do is find some expensive keywords like this like find a personal trainer or whatever and I can go into my monetized text, add a new group and call it main page or main page or something like that. We’re gonna go ahead and leave all this stuff the same except for monetize and then put where do you want to put it. Home page no. Pages yes. Posts yes. You can control it. You could say I only want it on these certain pages or these certain posts or all-or-none or whatever. We’re gonna go into manage ads and we want to find three or four really good keywords related to our market that our market would be interested in that cost a lot of money in Adsense. That means that it’s gonna show more expensive clicks and we’re gonna get more money. Now this URL could go to a site outside like comwith one page of content and Adsense or you could leave it to a page on your blog that’s about a personal trainer. Either way it’s going to show the expensive ads. I go into this more in your simple sites big profits desktop where we talk about the market flipper method. The market flipper method is definitely something that you want to go through because it’s gonna teach you how this information arbitrage stuff works so you can make a lot of money. This is the same thing that I’ve used to take a site from making 50 bucks a day on Adsense to making over $80, a day. It’s very simple! it works because it focuses on the user. 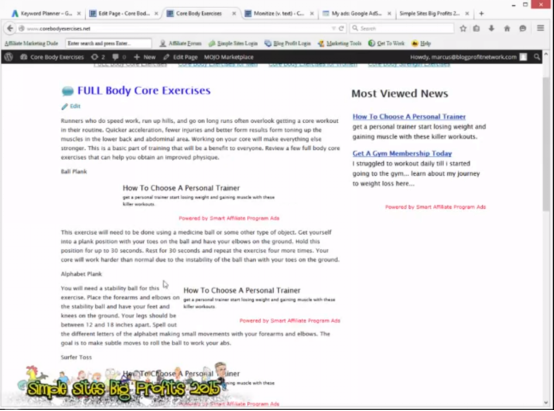 So we would take them out to either a page on our blog or we would put them to like personaltrainersite.org or whatever it is you would get related to that. Then we could put something like “get a personal trainer start losing weight and gaining muscle with these killer workouts” and then dot dot dot Save Ad. What’s gonna happen is it’s gonna start displaying these ads on your sidebar. 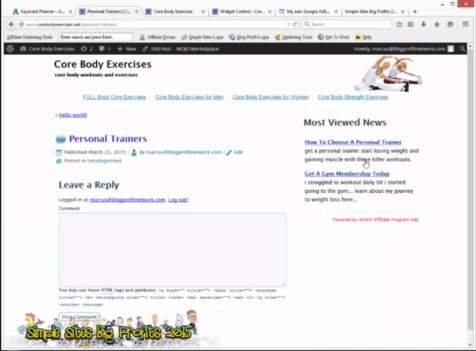 So how to choose a personal trainer here is going to show up here when they click it they’re gonna go to the expensive ads, they’re gonna click them, you’re gonna make money and it’s also going to track which one gets the most clicks so you can kind of adjust them and make even more money. This is how to build an Adsense Empire rather than just letting Adsense show ads and hoping and praying you make some money. Next we go through and say well what else is there? We can do maybe there’s something like a core body exercise affiliate program or perhaps there’s like something like gym membership and these guys pay a lot of money. If you say well you know you need to use these kettlebells instead of buying them why don’t you go to a gym thing or you can even send them to a site like buy workout stuff for less or whatever. So you could do like gym membership. You could do another ad and say “add new”, put “get a gym membership today” and you would make this go to com. Again, it would be about your stuff or you could even make a page on your own site where you could lead them to an affiliate. Very very simple! You could do something like “I struggled to work out daily till I started going to the gym, learn about my journey to weight loss here” Then basically they’ll go there they’ll click on the ads for the gym stuff which obviously you can see is a lot more expensive than the stuff related to just core body workouts. Same thing like if we were going to go kettlebells. This is again an expensive thing so what we’re doing is we’re loading this up with more expensive ads so we’re getting more expensive clicks because these people are selling stuff rather than you know just oh hey what our core body exercises. You can do the same thing with like if you were gonna go for p90x, which is a workout plan. You can see that this here is again an expensive more expensive click two dollars 72 cents here and on and on and on we go. What we’re doing is we’re taking them from our little site about core body exercises and putting them to other things. With your monetize plugin, you can manipulate everything. You can change it from most viewed news to whatever you want and you can also put it throughout the content. The cool thing about this is you can also add Adsense so you can put Adsense on here. See how it works. See what’s clicking on this stuff and see what’s making you the most money and obviously once you do this you’re gonna figure out that the plugins we have make you a lot more money. We’ll show you how to focus on your market more. So we can go here, we can go to monetize main location random and you can put the number of ads you want if you want one or two. What it’s going to do is it’s automatically going to insert these ads and rotate them so the best ones that are giving you the most money are going to be the ones that work for you. So we just go in here and we hit submit. What’s going to happen now is its gonna put those ads in your content. So “get a gym membership” right this is gonna get a good amount of clicks and they go to your expensive ads. Choose a personal trainer and they’re gonna go to the expensive ads. What’s happening is it’s rotating these ads and it’s changing the way they look to get you the most clicks possible. Because of more people that go to this stuff, the more money you’re gonna make and you can change it at the drop of a hat from Adsense to affiliate offers to whatever it is that makes you money in a really really simple way. For Adsense what we’re gonna do is we’re gonna go into our Adsense account and create a new ad unit. We can call this “CORE” and we’re gonna choose 336 x 280 which is one of the best converting ones. Now we’re gonna choose text ads only text ad style. We’re going to go default because that’s the one that gets the most clicks per ad unit. We’re gonna go ahead and save and get code. Now once the codes here we’re going to use synchronous, we can copy this and put this into our widget control. Click update Adsense and now what’s gonna happen is it’s going to put wherever you want. So you can see I can put this in pages, I can put it in post or just pages, and I can kind of control where this is going to show up. As you can see our Adsense block is going to show up here. Now with a new site like this sometimes it takes a while for Adsense to show up but you could see that on the pages it shows up now if I was to create a post right like this and you know we could just call this like “personal trainers”, you could see that on the post it’s not going to show up. So what these plugins are doing for you is they’re allowing you to control it. See we have most-viewed news here but we don’t have adsense unless they’re on the home page. This is very very powerful stuff that’s going to allow you to make a lot of money with Adsense . So the goal here is not just to put Adsense throughout our content like most people do but to actually control it, understand our market, learn about our market, send them to affiliate offers, get them to click on this other stuff in a very very cool way that makes them do things. What we’re doing is getting our users to interact with our ads rather than giving then generic ads that other sites think they want. It’s much in the same way as if you were to have like a news channel report and the news report says, “oh well the economy’s failing” instead of just saying “tonight at we’re going to talk about other stuff, if you want more information about this and how to beat it, go to our site economycrashloansite.com” and now they’re getting info. So we’re giving them the information they want in a way that’s really cool and sharing them with the things that they need that are going to help them thus increasing our Adsense revenue. 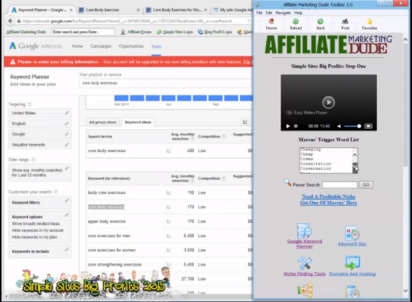 To learn more about this market flipper method and how to put Adsense on your site how to put these ads on your site that are gonna make you a lot of money go to simplesitesbigprofits.com, click on the Adsense tab or go ahead and get your simple sites big profit software, get these plugins get the tools and everything and get yourself a free evaluation where I can show you how to triple your Adsense income pretty much instantly. grab your copy of simple sites big profits, use these tips that we’re talking about. Adsense works it makes a lot of money but it can make you a lot more using these tools so start using these tools. One of the last ones that I wanted to show you before we close out is our content cache finder. This one is really really powerful because what it’s going to do is it’s going to allow you to have some image type ads as well. So we can go through here and we can click on “body” or whatever. We can make our own name. We can choose how many columns we want. We can do our order at random again. Open a new window yes. This is all about making your blog more interesting, getting people to click on more stuff. The more stuff they click on, the more money you are going to make. So you got to make it entertaining. You got to make it work. You got to get the things that they want to click on rather than just packing it with lame banners or standard Adsense ads that are gonna show you know exercise is good from some bitter that pays like 5 cents so you make nothing. We want to get you making the big bucks and the way you’re gonna do it is by controlling what people click on, getting them out to the different things in your market and branching from one market which is the exercises to multiple markets which is gym memberships and personal trainers and different things like that and you are going to see your income soar! This works on established blogs and it works on new blogs very very important. So use this stuff make more money get simple sites big profits. Start looking at the info arbitrage stuff you’re gonna learn how I built multi hundred thousand dollar Adsense Empire and a multi-million dollar affiliate marketing business all using these simple techniques of simply letting the market click things, figure out what they’re interested in and lead them to the things that make me money. Start playing around with these little tips controlling the way that your Adsense looks on your site getting people to other things that make you more money and start treating your Adsense business like a real business in 2015 and that is how you are going to outwit the competition. Make lots of money. GET CHEAP TRAFFIC AND MAKE A TON OF MONEY WITH IT. Thanks for watching! I’m Marcus I’ll see you at simplesitesbigprofits.com and we’ll make money online together.